Hi Oliveoil, Welcome to GOY. What a beautiful garden. Welcome to GOY. Did I read a comment form you Oliveoil...something about 'nothing professional' ? Well, this looks beautiful! You have a stunningly beautiful garden Oliveoil, love the brilliant colours.....and welcome to GoY! Hiya Oliveoil, you have a lovely garden! Lovely garden and a big welcome to you. You have a lovely garden Oliveoil. No wonder it is your pride and joy. How perfect, looking forward to you being with us on GOY. The members above said it all for me! love it Olive! Hi Olive, thats a beautful garden. nice to meet you. Your garden is stunning, you should be proud! 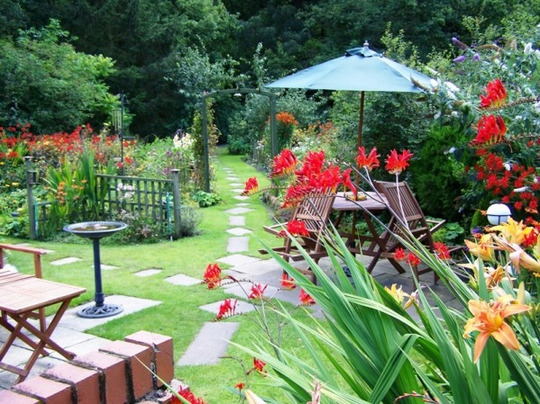 lovely garden, i would love to find out what is beyond both paths. What a picture your garden is! Thank you Duddyboy - I love pansies, they are so cheerful and such pretty colours and as you say they fill in spaces which need colour, they are such a versatile plant. I remember when my second eldest daughter was tiny her running up the garden to help me deadhead the pansies. She loved them. Now she is all grown up, married and has a lovely garden of her own. Keep up the good work, it will bring hours of pleasure I am sure, thanks again for your contact. This certainly is stunning, you've done a magnificent job! Thanks Busybee26 glad you like it, the purse is a lot lighter too, not complaining though just love being busy in the garden and enjoy visiting and spending in garden centres, thanks again for looking. Me too, Oliveoil, I can't help but spend! The gardening bug has really got me this year, I can't leave a GC without buying something. I dread to think how much I've actually spent on the garden so far, but I know it's all worth it and every purchase will give me many years of pleasure! It certainly will Busybee just enjoy. You have a very lovely garden ! Thank you Katie - so pleased you like it. Hope your feeling better about your own now and enjoy walking around the garden centres it is amazing what you can see at various times of the year. I simply just love your garden Olive. Thank you so much for enjoying my garden Rose. Pleased you like. thank you Gardenerzin glad yoou like it. the garden of your very beautyful.I feel very comfortable when watching it. thank you very much, it is a very peaceful garden. :O) and it has changed very much since this first picture was taken. Not much grass left in the garden now.